Gametocyte/Gamete GFP expression in male and female gametocytes. No expression could be detected in asexual blood stages. PB000198.00.0 (PF07_0089, hypothetical protein conserved; PSOP1). The protein is detected in a proteome analysis of ookinetes and contains a predicted signal sequence. 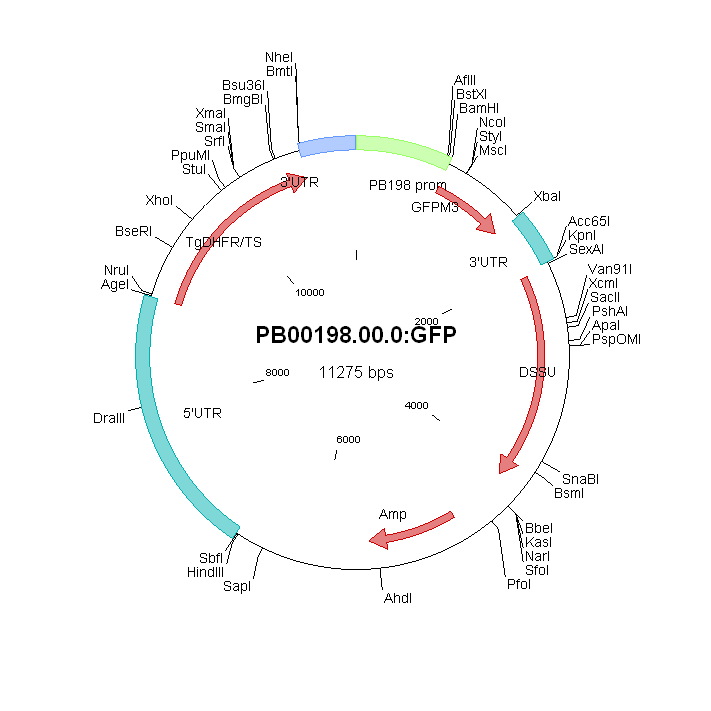 See also RMgm-88 for a mutant lacking expression of PB000198.00.0 (PSOP1). Phenotype analyses indicate absence of promoter activity in asexual blood stages and active transcription in both male and female gametocytes. The absence in asexual blood stages and presence in males and females is in agreement with proteome analysis of males and females (Khan, S.M. et al., 2005, Cell, 121, 675-87). See further 'Additional information. The construct GFPcon (RMgm-5) containing GFP under the control of the eef1a promoter formed the basis for the construct driving expression of GFP under control of the PB000198.00.0 promoter. This constructs contains a c/d-ssurrna target fragment for integration into the c/d-rrna genomic locus. GFP is flanked by the 3'-UTR sequence of the dhfr gene of P. berghei. The eef1a promoter region is replaced by a 754 bp fragment (SmaI/ BamHI) of the promoter region of PB000198.00.0. Additional remarks genetic modification The construct GFPcon (RMgm-5) containing GFP under the control of the eef1a promoter formed the basis for the construct driving expression of GFP under control of the PB000198.00.0 promoter. This constructs contains a c/d-ssurrna target fragment for integration into the c/d-rrna genomic locus. GFP is flanked by the 3'-UTR sequence of the dhfr gene of P. berghei. The eef1a promoter region is replaced by a 754 bp fragment (SmaI/ BamHI) of the promoter region of PB000198.00.0.